Do you want a beautiful body without spending a whole fortune on a membership fee? Then you are on the right place. Going for bodyweight exercises can actually help you achieve your desired fitness and save you a chunk of money. Body weight exercises are those in which you do not have to use any free weights or machines, it is all about pulling your own weight against the laws of gravity. Body weight exercises are said to be one of the fastest ways to get in shape, also it delivers the results way faster than any other conventional form of gyming. Moreover, even the simplest of all body weight workouts are so intensive that they put the focus on almost all of your body’s core muscles. Once you get habitual to this kind of training, you will definitely be able to see the results in time. It will increase your self-confidence, sense of self-worth, better stamina, better blood tests and overall health. If you want to be healthy and fit there is no better way to achieve it than starting from an intense and result oriented body weight workout routine. Always follow a healthy diet and eat properly. Get sufficient amounts of sleep. A proper pull up is initiated with a full arm extension, stable lower body, and requires you to pull your body until your chin reaches the top of the pull-up bar. Grasp the bar with an overhand grip (hands facing away). Your hands should be fairly wide apart certainly wider by at least a hand width than your shoulders. You have to just find the right grip; not too wide, not too narrow. This is known as the Goldilocks zone. 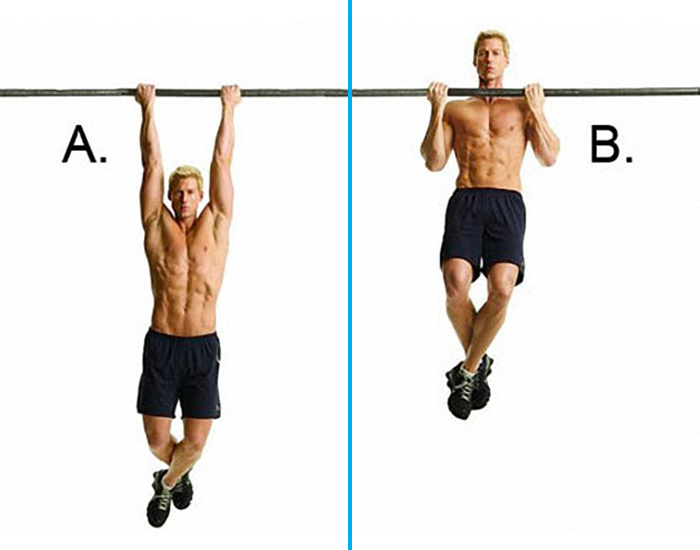 Hang from the bar with arms slightly bent, breath in and pull yourself up to the bar. To do this workout you have to first lie down. Keep your arms and legs straight. With your neck in neutral position. Now raise one of your arm and the leg opposite to it at the same time. You have to hold for some seconds!! Slowly lower back to the starting position. An awesome exercise to strengthen your back. A chin up is usually another name for a pull up with a supinated grip (palms facing inwards). 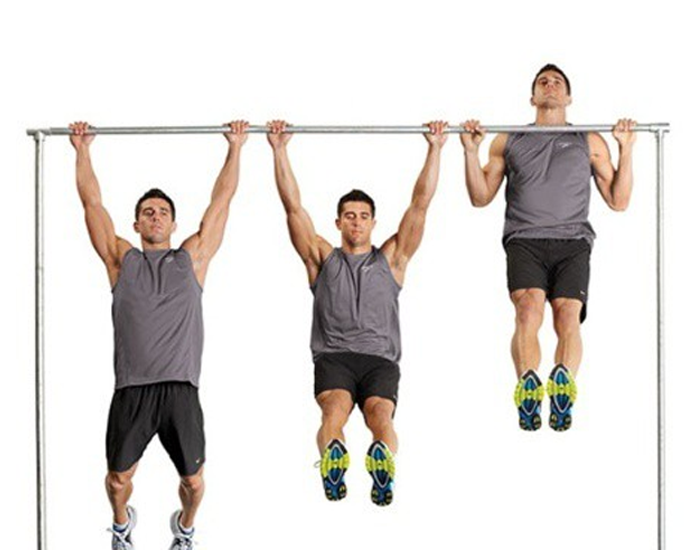 It works the on same muscles as a pull-up but puts more emphasis on the biceps. Decline Push ups target your bicep muscles and are performed with your hands starting above your toe line. Example: Your hands placed on blocks while your feet remain on the ground. Decline Push up is one of greatest mass-builder for your biceps and can be used to increase the overall muscle strength of your body. One of the most effective exercises that not only targets your chest but also your shoulders, triceps, back, and even the core. If this compound exercise is done right, it can bring amazing results to your body. Your main focus should be to work towards increasing your strength especially through following deep reps and a proper posture. This is one of the most common yet effective body weight chest workouts which can definitely deliver promising results in a short period of time. To start with it, get yourself into the push-up position, with your weight evenly distributed between your toes, your legs, hips and back in a straight line. Then push down your upper body by bending your elbows. Make sure that your arm angle is 90° at the bottom of the movement. Pike push ups actually help your shoulders in building up sheer muscle strength. An excellent workout for shoulders!! Assume a push-up position on the floor, keep your arms straight and your hands shoulder-width apart. Now lift up your hips so that your body forms into an inverted V. Bend your elbows and lower your upper body until the top of your head nearly touches the floor. Pause, and then push yourself back up until your arms are straight. To do this reverse burpee you should begin standing with your arms extended overhead. Now bend your knees and in a controlled motion push all the way to the floor. Roll onto your back, drawing your knees towards your face. Use momentum to kick forward to land on your feet. For single leg box squat, you have to sit tall on a bench or chair with your back upright and naturally arched. Now hold your arms straight out in front of you at your shoulder level and bend down by raising one foot off the floor in front of your body. This exercise is also known by the name of Pistol Squats. If you’re looking for a quick, but intense workout to tack onto the end of your run or strength training then you should go for wall sit. For this workout, set a timer for each wall sit and do as many reps as possible within that period, or do it in a form of endurance training. A body weight exercise is all about following the proper posture and techniques strictly. If your attention is on point and your mind is dedicated, then you will be able to achieve your desired fitness goals in a short period of time.